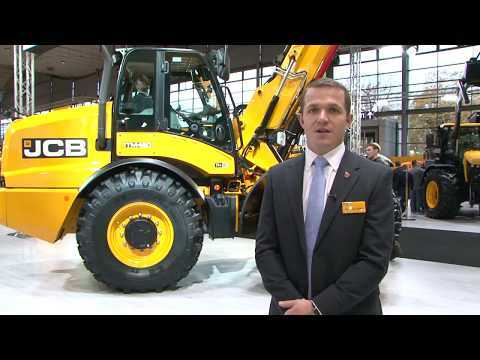 JCB Agriculture have recently launched a bigger capacity, more productive telescopic wheeled loader at the Agritechnica machinery and technology show (Hannover, Germany, 12-18 November). The launch of the new JCB TM420 extends JCB’s telescopic wheeled loader range to encompass a broader span of performance capabilities. The new JCB TM420 shares all those positive characteristics while raising the bar in terms of outright performance and overall productivity. To handle the increased payload capacity of the new TM420 telescopic wheeled loader, all pivot pins and bushes on the articulated chassis joint and the boom have been enlarged. Daily checks for engine oil, coolant and washer fluid levels are quick and easy because they are part of the start-up procedure for the TM420, displayed on a full colour instrument panel that provides information and warnings in a clear at-a-glance format. The new JCB TM420 features proven powertrain components, including the 4.8-litre version of JCB’s EcoMAX four-cylinder engine, equipped with selective catalytic reduction (SCR) to meet latest engine emissions rules. ‘Clean burn’ combustion means there is no need for the added complexity of a diesel particulates filter (DPF). All key systems on the new JCB TM420 are watched over by JCB LiveLink, which gathers data from sensors and generates pre-emptive servicing and potential fault alerts monitored round the clock at JCB’s Uptime Centre to optimise machine performance and availability for work.